How can the Feds enrich public education? I'm delighted to be attending a White House briefing on public education. I know there will be a lot of people in the room and if I have an opportunity to make some suggestions, I'll have to be brief and focused. Below are three recommendations for what I think we need to do on a federal level. Of course the details matter, yet I thought it would be helpful to set some worthwhile aims. Effective school systems should align federal, state and local policy that supports teacher leadership. Federal policy should ensure that all teachers have effective working conditions. Most importantly, the federal government should do everything it can to ensure that all children are "school ready." That means that all children should be well-rested, well-fed and healthy. All children should come from safe homes and neighborhoods in which caregivers have time to spend with their children. "School ready" children are curious and eager to learn. If you had a few moments to talk about education with White House officials, what would you like to say? Once again, the print edition of The New York Times (NYT) included the "Building a Better Teacher" theme for the Schools For Tomorrow conference (Jun 25 & Jul 2, 2012; p. A18 & p. A16, respectively). The NYT should consider modifying the "Building a Better Teacher" theme. "Building a Better Teacher" is an ideologically-loaded theme that 1) advances the notion that schools are failing because of bad teachers and 2) alienates over 3 million teachers in the US. And not one of the 14 featured guest speakers is a teacher. Of course teachers can get better at their craft; we are life-long learners. Yet Secretary Duncan estimates that 10% of California's teachers don't belong in the classroom. Dan Goldhaber, a research professor with the Center on Reinventing Public Education, estimates that nationally, the number of unqualified teachers is closer to 7%. So what are we doing for the other 90-93%? If we want teachers to be better at their jobs, we can first cultivate effective working conditions. Yet the idea of "Building a Better Teacher" is aligned with the notion of human capital; "If we only had good teachers, then education would improve." A more worthwhile approach to supporting education is to consider teachers' working conditions and their social capital; "If teachers have the support to collaborate and then influence curriculum, instruction, assessment and policy, then education will improve." Better working conditions translates into deeper teacher and student engagement. We can also consider the importance of children's "school readiness." Children will learn better if they are well-rested and well-fed, feel safe and are curious. Children's proximity to poverty diminishes their school readiness. Families in or near poverty are less able to provide the stability necessary for children's healthy development. This suggests that we might consider "Building a Better Economy" as one means to better engage students in their own learning. The idea that print media are failing because of weak journalists is as preposterous as the idea that public education is failing because we have weak teachers. What if teachers decided to hold a conference called "Newspapers for Tomorrow" with "Building a Better Journalist" as a theme? The Guest Speakers would feature everyone BUT journalists. In 2001, the Philadelphia Public School Notebook reported that the State of Pennsylvania had taken over the Philadelphia School District. How has that oversight helped students and teachers be more engaged? What stability or efficiencies has state oversight provided? Most importantly, what are examples of effective school district organization? How can we help teachers create effective working conditions so that they and their students can flourish? In 2011, The Washington Post reported that "[t]he U.S. military is on track to spend $113 billion on its operations in Afghanistan this fiscal year, and it is seeking $107 billion for the next." Are there better uses for that money? The Philadelphia Inquirer recently reported that the outgoing CEO of Sunoco is receiving about $37 million in compensation for liquidating assets. How can we create a sustainable economy that honors labor and fosters a commitment to the social good? Individual excellence is essential, but we are all more effective when we advance social equity along with individual liberty. If the explanations for inequitable funding of public education are accurate (numbers 1, 2 and 3 above), then what are the solutions? Below is my list -- what's yours? Reauthorize a modified ESEA that acknowledges "college and career readiness" with an emphasize on systemic creation of "school readiness." All children should arrive at school safe, well-fed, well-rested, and curious. Re-visit the 14th Amendment and the Brown v. Board of Ed. decision with consideration of funding inequities that create a "suspect class." All schools should be able to fund education at equal (if not equitable) levels. Ensure teacher representation on state-wide panels that roll-out RTTT. Ensure equitable funding of all school districts akin to NJ's Abbott decisions. Create real equitable choice options so that students can attend schools of interest anywhere in the city -- or across District boundaries. Develop and sustain teacher leadership so that teachers lead the integration of curriculum, instruction, assessment and policy that engages students and teachers. Integrate the labor frame with professional and social justice frames for an enriched unionism. Cultivate cohorts of teacher leaders who are connected and can advocate for effective working conditions, participate in teacher-led research, and foster democratic learning environments . Provide operational flexibility for principals to build community partnerships, coach teachers, know students, and build the capacity of learning organizations. Require extensive support for nurses, social workers, therapists and counselors so that all students with diverse needs are recognized and supported. View teachers as experts and support the professional development needed so that teachers can effectively lead schools. Create professional learning communities within and between schools and the community so that teachers are facilitating and modeling the collaboration necessary to life-long learning. Today I read the front page of the Philadelphia Inquirer and learned that the outgoing CEO of Sunoco is receiving about $37 million in compensation for liquidating assets (i.e. shedding at least 175 jobs). Of course we want a robust economy, and I'm sure the SUNOCO CEO has a skill set that is valued by many. But I wonder if her skill set is any more complex than those of teachers who make hundreds of decisions on a daily basis. These decisions affect the health, engagement and lives of 180,000 children across Philadelphia, and millions more across the US. At the same time, public education has been framed as THE leverage point to enrich our economy. It has been said that we need college- and career-ready students who can help the US retain its economic prowess. Yet I thought the purpose of education was to advance democratic equity. A robust democracy is not at odds with a sustainable economy. We need teacher leadership to ensure that smart policy influences curriculum, instruction and assessment. We need effective working conditions so that teachers can flourish. We need teachers to be seen (and see themselves) as professionals. We need time to study and inform policy. I know that all of us won't always agree on policy -- and that is a good thing. But I'd like to believe that we see teachers as professionals who have the experience that is essential to dynamic education systems. And if we take care of our teachers, we take care of our students and schools -- and our society. How much are teacher worth? Next week is Teacher Appreciation Week. Which teachers do you appreciate, and why? Below is my list of teachers that I appreciate. Thank you for all that you do. Josh has been teaching for about 12 years. Over the last decade, he has led professional development for colleagues, integrated inquiry-driven history and English curricula, and coached public school students for the Young Philadelphia Playwrights, several of whom have had there work performed by college students at Temple University. Each year, Josh and his students and participate in the Art in the Open as they explore civic space and urban studies. Claire is an exceptional beginning teacher who sets up student-centered classrooms where 1st-graders can explore academic content alongside social/emotional wellness. She wants her charter school students to be kind and thoughtful, and she is especially adept at helping her students see themselves as part of a community and part of the larger world. Claire also runs PhilaSoup -- so she is successful with her new job as a teacher AND helping teacher connect with cool academic projects over soup. Anissa is a teacher leader who serves on the advisory board for the Philadelphia Student Union. She is also a moving force behind TAG Philly (Teacher Action Group). Anissa has facilitated professional development around education and social justice issues, coordinated the "Inquiry to Action Groups" and co-founded the annual "Education for Liberation Curriculum Summit." Carrie came out with a cutting-edge report on the importance of teachers' social capital in sustaining education reform: The Missing Link in School Reform. This article can serve as a foundation for ED's RESPECT Project as it emphasizes the importance of teachers' voices in education reform. Coming from the Pitt School of Business, the report offers a respectable counter-point to a one-sided economic model of education reform. My good friend Steve Owens has posted another insightful blog about teacher leadership (see below). If you'd like to check out more of Steve's writing, go to Education Worker. Yes, I know this book was published in 2009. And yes, I know that it's 2012. Perhaps this book was ahead of it's time and it's moment is now. Against a policy backdrop of reductionist accountability run amok, The Mindful Teacher by Elizabeth MacDonald and Dennis Shirley quietly restores a measure of sanity and balance. This book could not have arrived at a better time for educators feeling under siege. 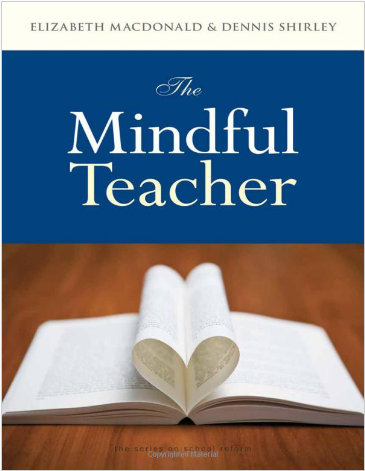 The Mindful Teacher displays profound respect for the teaching profession by throwing into high relief the intellectual and spiritual dimensions of teaching. It is a demanding volume that honors the reader by showing confidence in the intellectual capabilities of educators, drawing on the best of the philosophical traditions of both east and west. The book is more than a philosophical tome, however. It constantly grounds this elevated discourse in concrete examples of improved teaching practice and better student learning, through six moving case studies of urban teachers, displaying teaching as a profession in the finest sense. MacDonald is a teacher in the Boston Public Schools; Shirley is a respected researcher and academic. Together they pioneered the Mindful Teaching seminars, really a professional learning community (PLC) which is a product of an exemplary school/university partnership. Dennis Shirley is a rare academic who is humble enough to see the correct role for academics in the education enterprise. He sought ways to respectfully support educators. Rather than pushing an agenda on a group of hard pressed urban teachers, he supported a process enabling them organically discover the questions they themselves needed to explore. An essential part of the eightfold structure of the seminars is the role of meditation in creating a space in which mindfulness can grow. The concept of mindfulness emerges from the Buddhist tradition, and the concept of mindful teaching is advocated in the book as a means of mitigating alienated teaching, a concept borrowed from Marx. The authors handled the practice of meditation in their seminars in a way that made it accessible and helpful to people from a variety of spiritual traditions. The Mindful Teacher concludes with an exploration of dialectical tensions in the profession of teaching. The Seven Synergies are individually necessary and jointly conditions for mindful practice, including concepts such as a caring disposition, professional expertise and collective responsibility. The Triple Tensions acknowledge the existence of polarities in teaching practice: contemplation and action, ethics and power, the individual and collective. The faith the authors show in us, that we can hold these tensions in our minds in what Estelle Jorgensen calls a “both/and” synthesis, demonstrates a profound respect for educators as intellectual and spiritual actors. I was a bit troubled near the end of the book when the authors referred to teaching as a vocation. As a labor activist, I fight for professional compensation and working conditions, and worry that teaching as a vocation leads us down the path to martyrdom. But then I realized what The Mindful Teacher had taught me: profession and vocation are just one more tension that can be creatively embraced. I felt both moved and honored.